We are having another wonderful mini hop over at Creative Cutter Room. Up for grabs is the wonderful Mother’s Day Bouquet Cartridge. So be sure to head over to CCR and join in the fun! Here is the criteria for the challenge. You need to incorporate the following in your projects. Must use two different types of flowers. I am going to give this candle holder to my mom so I thought I would “dress it up” a bit. I made the flowers by using my 50 States Cartridges and the large rose was made using my Gypsy and welding some “leaves” together. Here is a close up of the flowers. They started out as white and I glitter misted them and inked them. Here is a shot of the card. This is an angled shot to try and show the pretty glitter on the paper. The cut really well in your Cricut. blogs and check out their wonderful work! What a great idea. This will be great to do with the FFA Floriculture Class. Just stunning! You are so lucky to have a Mom to give it to. Cherish her with all your heart. In a flash she could be gone. How I hate Mothers Day since Mom left us. TFS! Very pretty!! Beautiful project...thanks for sharing! Very pretty. Glad I was finally able to get to your posting! 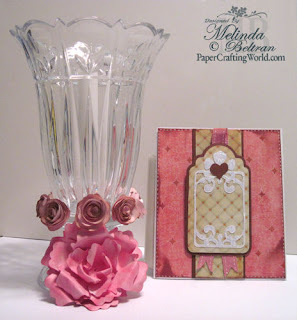 I love what you did with the vase, very pretty! This is so lovely Melin! I love those beautiful flowers! I'm a whole day late hopping but I just love this mini hop from CCR! It is so short and sweet and you are all so talented! I always love the fun projects! What gorgeous flowers you've added to the candle holder. Wow! The card is such a lovely way to complete the set. Beautiful. I love the vase with the flower surround. Thanks for sharing! Your paper flowers are just beautiful...I can't believe they started out white!! The card is soo pretty...perfect for Mother's Day! TFS!